New to email marketing? We have got everything you need to know to avoid common rookie mistakes in this field. In fact, this is not unique to newbies, even experienced marketers who are indulging in email marketing can learn a thing or two. This is of high import as it is required by law as well. You need to have subscribers’ permission before sending anything out. The list should only have subscribers that have given their permission through sign up forms or explicitly. You should have some kind of proof that the subscriber gave his or her permission. You also must make sure when taking permission that the subscriber knows what he is signing up for. Permission allows you to have only those people who are interested in your services or products. Even if the number is small, permission based emails will likely have more response. Your emails will not be moved to spam or have legal ramifications for that matter because you acquired permission. 57% of email subscribers spend from 10 minutes to a full hour on marketing emails. This shows that if they have interest they will see your email. This is a big NO, if you are buying from unreliable sources, and a big YES, if you buying from sources that offers guarantees and results. Even though, buying or renting an email can be very effective, but there are also a lot of sellers who are offering dead lists that does not work and in many cases lead to the dreaded blacklist. These unreliable vendors often offer millions of emails. They collect these with prize offering tactics and then sell them to businesses. On the other hand, reliable sellers like Ninja Emails collect emails from those who are interested in getting new offers in their email and that make a big difference. Most people are not interested. Many of your emails will likely be blocked by spam filters. Your bounce rate will increase. In the worst case, you may get blacklisted. People change email addresses all the time. Suppose someone changed employment, their former email address is probably inactive. This leads to some emails becoming stale and eventually your list becoming stale. These lists can cause high bounce rates and low subscription. You need to keep your list updated and act in time. If you received permission from a user, do not take weeks to get to them. Send them an email right after the permission. Spam filters are the worst nightmare for email marketers. These filters have gotten very smart and analyze emails carefully to classify them as spams. Read about how spam filters work. To avoid these filters, you need to work on the content and design of your email. There are a few tricks you can learn to easily push past these filters. Making your emails immune to spam filters is important because a lot of marketers do not even know that their outbound emails are going directly into spam of their potential customers, even those who have given permission. There is a great deal you can find about how to make your email’s content high quality. This video shows 5 tips about writing an effective email newsletter. When you are new to something, you try to follow someone who has had success with their efforts. In a general, this is a good approach. 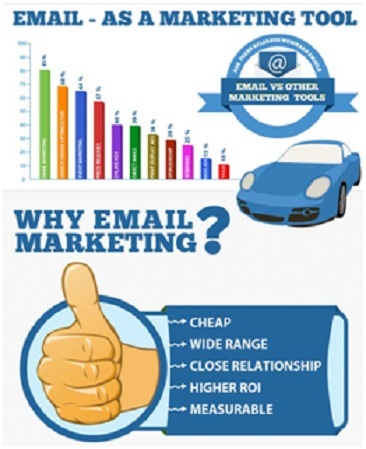 However, in email marketing if something worked for one business does not mean it will work for others as well. The key is to learn about your audience and what they like or do not like.You can learn about this when you sign them up. Use only that content that is relevant to your subscribers. If your subscribers signed up to receive some specific kind of product or service, they should receive emails regarding that only. Keep a simple subject line without revealing too much about what is inside. The curiosity will lead them to open the email. It is a jungle of marketing emails out there and it important to stand out let alone have errors in your campaign. You can resolve small issues by testing few emails on popular email ISPs. Send yourself emails and see if the links work fine and the images are how they are supposed to be. There are so many platforms for people to view emails on like mobiles, desktops, tablets. Make sure the images appear correctly on all devices. You can use online tools to analyze your emails. And with experience, you can start performing A/B testing on your emails. Few marketers use message statistics to analyze their campaign’s outreach and success. The open rate is affected by mailing frequency and through the relationship between customer and sender. Click rate reveals a lot about your email’s content. Delivery rate can help you identify if your list is getting stale. It is important that you analyze the reports about the performance of your campaign. Look for trends and learn about where your campaign has weaknesses. If your emails are getting a lot of click rates on weekends, it might be time you sent all your emails over the weekend. If unsubscribe rate is high, the quality of your list is down. These numbers can tell you a lot about your audience too. As an email marketer, it is crucial for your success that your emails are going to permission-based subscribers. Everything comes after you have received permission. You need to focus on the content of your email not only to avoid spam filters but also influence the viewer. Overdoing things will likely have your email flagged as spam. It is a constant process and with each campaign you will learn new things. Experimenting is good but only where there is room for playing around. At the end of the day, avoiding small mistakes will automatically make your campaign fruitful. This entry was posted in Email Copywriting, Email Delivery. Bookmark the permalink.